Breiwick has performed with numerous notable jazz artists, including Matt Wilson, Dan Nimmer, Joe Sanders, Pete Zimmer, Adam Larson, Ralph Bowen, David Hazeltine and David Bixler. Jamie has performed with R&B artist Eric Benet, and was featured live in his recent music videos, “The Hunger” and “You’re the Only One”. Jamie was a featured artist on the nationally syndicated NPR show “Says You!” and has been a featured soloist with the Florentine Opera Company. 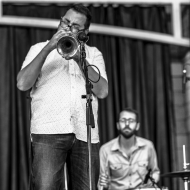 Jamie’s current band projects include Dreamland (The music of Thelonious Monk), KASE, Awake Nu (The music of Don Cherry) and the Lesser Lakes Trio. Among his notable past band projects were leading the eclectic fusion group Choirfight, the legendary Milwaukee band Clamnation, and performing with We Six, the faculty jazz sextet of the Wisconsin Conservatory of Music from 2005-2010.